This article is about the cactus-like enemy appearing in several Mario games. For other uses of the name "Pokey", see Pokey (disambiguation). Pokeys are cactus enemies that are typically composed of three to five spherical body segments. To defeat a Pokey, typically each body section must be destroyed; however, defeating the head usually kills the entire enemy. Pokeys, along with Ninjis, Shy Guys, Bob-ombs, and Birdo, originate from the non-Mario game Yume Kōjō: Doki Doki Panic, which later became Super Mario Bros. 2. Relatives of Pokeys appear in Super Mario World 2: Yoshi's Island and Yoshi's Island DS. Blow Hards, Cactus Jacks, and Spiked Fun Guys are all part of the Pokey family. Pokeys first appear in Yume Kōjō: Doki Doki Panic and Super Mario Bros. 2, and will slowly chase after the player. In this game, Pokeys are green and can be defeated by throwing objects at their body segments, or picking up one segment at a time. They first appear in World 2-2. Pokeys reappear in Super Mario World. This time, Pokeys are yellow and cannot be defeated in the same way as in Super Mario Bros. 2. Throwing a shell or a Grab Block at them defeats only segment, although a Super Star will allow the player to defeat it entirely at once. Mario and Luigi can also defeat a Pokey by sliding up or down a hill at the cactus. Another option is to defeat them with Yoshi, who can eat their body segments one at a time. The number of body segments present depends on if Mario has Yoshi or not. If he does, Pokeys have five body segments. Without Yoshi, Pokeys only have three segments so that Mario can jump over them. Pokeys appear in the Special Zone level "Groovy", and Yoshi's Island 4 in a secret area. Also, in Super Mario World: Super Mario Advance 2, after the player beats the Special Zone and unlocked all of the exits, Pokeys turn into a bizarre grey spiked creature with a face on each body segment. Four Pokeys (once referred to as a Pookie) appear in Shifting Sand Land in the game Super Mario 64 and its remake. Pokeys in this game have bright orange pupils. Here, Mario can destroy each body segment with a punch, kick or by throwing a Bob-omb at it; attacking the head defeats it and causes the whole body to instantly disappear. If Mario waits too long after destroying any of his segments, the Pokey will grow them right back. They give Blue Coins when defeated. If Mario gets hit by a Pokey, he will lose two wedges of health. Unlike most enemies in this game, Pokey does not respawn shortly after defeat. Due to their graphics being flat textures, they always face the camera in this game. In Super Mario 64 DS, the Pokey's graphics are updated to reflect their design as seen in Mario Kart: Double Dash!! However, jumping on their head now damages Mario instead of defeating the Pokey, and they are capable of turning, but graphically, still use flat textures for their segments. A smaller variety of Pokeys called Pokey Heads appear in Super Mario Sunshine as well as Pokeys themselves. In this game, both of them have flowers on their heads, large mismatched eyes, and wide grins high on their faces, and their spikes somewhat resemble stubble. Pokeys lie in wait underground, with only the flower on their head visible at first, and will pop up when Mario approaches. To defeat a regular Pokey, Mario must come close to the tall cactus, causing the Pokey to attempt to crush him, as the Pokeys are planted to the ground, and cannot move. However, the Pokey's spikes will get stuck in the ground and Mario can jump on its head to defeat it. If Mario can manage to stomp on a Pokey's head while it is upright, the defeated Pokey will yield three Coins instead of one. Some leave behind a Blue Coin when defeated; jumping on these while upright yields two regular Coins in addition. One can see goopy bubbles rising from the flower on their heads as they bop up and down, which is due to being created by Shadow Mario and his Magic Brush, like the other enemies of Isle Delfino. A Pokey in New Super Mario Bros.
Pokeys only appear in World 2-1 in New Super Mario Bros. with their Mario Kart: Double Dash!! look. In this game, a Pokey can only be defeated by shooting fireballs at its body segments, rolling over it with Shell Mario, or by crushing the cactus monster as Mega Mario. If they are hit in the head, they get defeated instantly. Without these power-ups, Mario must attempt to jump over the Pokeys. Some Pokeys have over ten body segments, requiring Mario to use special platforms to jump over these tall creatures. The Mummipokey, an undead Pokey, appears as the World 2 boss. In Super Mario Galaxy a single red-orange Pokey with a yellow flower appears in the Dusty Dune Galaxy. It attacks by trying to crush Mario, similar to in Super Mario Sunshine, except that now it doesn't get stuck in the ground, and is mobile. It can be defeated by destroying all its body segments by Spinning, or by jumping on its head. Pokey Heads also appear, but now they are green. Big Pokeys with a more typical yellow color appear in the Good Egg Galaxy and the Dusty Dune Galaxy. These giant Pokeys can only be defeated by spinning a coconut at their body, and then jumping on or spinning into the upside-down head. In the sequel, Super Mario Galaxy 2, only Pokey Heads reappear. In New Super Mario Bros. Wii, Pokeys have been given another redesign. They no longer have flowers, and are covered in green spikes, with three prominent ones on top of their heads. Following this game, the new design becomes standard for all Pokeys, replacing the previously-standard Mario Kart: Double Dash!! design. As in Super Mario World, Yoshi can eat them one section at a time, but eating the head defeats them instantly. Fire Flowers again are effective, and the Ice Flower can freeze them. At every vocal "bah" in the music, Pokeys will turn into an alternate non-spiked form, making each body segment resemble a fruit. Yoshi can eat an entire Pokey instantly in this form, and if he does so, he will lay an egg with a power-up inside, depending on how many segments the Pokey had: 1-3 segments will give the player 3 coins, 4 segments will give the player a Super Mushroom, 5-6 segments give a Fire Flower, and 7 or more gives a 1-Up Mushroom. However, even in their non-spiked form, Mario still cannot safely jump on them, while Yoshi still bounces off them. They appear only in World 2-5. Pokeys are seen in desert or canyon areas in Super Mario 3D Land, where they usually appear in groups of two or five. They look as they did in New Super Mario Bros. Wii. To destroy them, Mario can hit them with a Super Star or use his Boomerang, Fire, or Tanooki forms to knock out one segment at a time; however, Mario can't jump on them without becoming Statue Mario because they are spiky. Pokeys reappear in New Super Mario Bros. 2, behaving the same way as in the previous games, except they do not turn into their non-spiked fruit-like forms like in New Super Mario Bros. Wii, since Yoshi does not appear in the game. Pokeys reappear in New Super Mario Bros. U. They are found in Perilous Pokey Cave and once again turn into their fruit segments. Pokeys have the ability to stand on the ceiling without falling off. Also, Mega Pokeys appear in Morton Koopa Jr.'s battle, who uses his hammer to knock segments into Mario's path. No normal Pokeys appear in Super Mario 3D World. However, a variant known as Snow Pokeys appears instead. Pokey reappear in Super Mario Run in the levels Pokey Vaulting and Desert Fuzz. Pokeys can either remain stationary, or move forwards slowly. If Mario defeats a body segment of a Pokey, the rest of the Pokey is defeated too. Yoshi can safely jump on Pokeys. Their sprites from New Super Mario Bros. Wii are used in this game. A Pokey as it appears in The Super Mario Bros. Super Show! Pokeys are seen infrequently on The Super Mario Bros. Super Show!, where they typically appear in episodes that have a Western setting or take place in a desert, often appearing as antagonists. On the show, Pokeys are portrayed as being capable of speaking, making themselves resemble ordinary cacti to blend in, and they also possess primitive, arm-like protrusions. Additionally, in "Escape from Koopatraz," a Pokey is part of Judge Koopa's jury. In Dinosaur Dilemma, some Pokeys gang up on Mario and Yoshi as they are traveling through a desert, and succeed in separating the two by knocking Mario into a hole, before wandering off. In the next book, Flown the Koopa, some Pokeys wander onto the path Mario, Luigi, Toad and the Mushroom King are using to get to the International Dino-Flying Derby, but Mario knocks them aside with his plunger. In the Paper Mario series, Pokeys have a different appearance, with fewer spikes and a head segment somewhat resembling a cat. In the game Paper Mario, Pokeys gain a few new abilities. Pokeys can now use their body segments as projectiles, launching them to attack opponents. Pokeys also gain the ability to summon other Pokeys, which rise from the ground when called for. Also, a new variety of Pokey is introduced: the Pokey Mummy. When it is defeated by Mario, the player sometimes obtains a Dried Fruit. A Pokey is one of the enemies that can appear in Shy Guy's Toy Box when Bowser asks Peach what Mario is most afraid of. Pokeys also appear in Paper Mario: The Thousand-Year Door as rare enemies. A team of three Pokeys, known as the Pokey Triplets, are a fighting team in the Glitz Pit. Pokeys also appear in the game's Pit of 100 Trials. In this game, they attack by slamming the player, doing 2 damage, but they can also throw their body segments like in the previous Paper Mario game, doing 3 damage. When a Pokey loses all its body segments, it attacks by bonking into the player, doing 4 damage, so it's better to defeat them before they lose all their body segments. The game introduces a new species of Pokey, the Poison Pokey, that appears in Riverside Station. Pokeys are unique in this game, in that performing a Superguard on a thrown body segment will send it back to the Pokey, doing the same amount of damage to it as it would have done to Mario. Pokeys appear in Super Paper Mario in places such as Gap of Crag. They attack by throwing their body segments, like in the previous Paper Mario games. When they lose all of their body segments, they attack by just hopping towards Mario or his allies. The Poison Pokeys from the predecessor also appear, and they appear in places including Castle Bleck and the Flipside Pit of 100 Trials. A new species is introduced, the Dark Pokeys, that only appears in the Flopside Pit of 100 Trials. Pokeys sometimes drop Horsetails when defeated. Tippi is not sure whether Pokeys are plants or animals. Pokeys reappear once again in Paper Mario: Sticker Star for the Nintendo 3DS. Both regular yellow Pokeys, using their design from New Super Mario Bros. Wii, and a green variety, more closely resembling their original appearance in Super Mario Bros. 2, appear. A regular Pokey can't be jumped on, unless an Iron Jump sticker is used. They have 16 HP and the green ones have 20 HP. Rather than throwing their body segments like the previous games, these Pokeys attack by toppling on top of Mario; sometimes Mario will get crumpled if he does not block the attack. Each time a Pokey loses a body segment, its attack goes down. Tower Power Pokey, a Pokey corrupted by a Royal Sticker, serves as the boss of the second world. Pokeys are sometimes aided by Paragoombas and Sombrero Guys (if it was not destroyed). As shown in early builds of this game, the Paper Mario: Sticker Star Pokeys were originally going to retain their previous appearance from past Paper Mario games, with no changes. This game also shows that Pokeys have flowers underneath their heads as shown when Tower Power Pokey heals. Pokeys return in Paper Mario: Color Splash keeping their appearance from the previous game. They are only found in Mustard Café along with Green Pokeys, which also return from Paper Mario: Sticker Star. They come out from shifting sands, only showing their head as if they were sharks in the first part of the level, and showing their full body in the rest of the level. Pokeys also can leap over Warp Pipes that Mario must cross. Mario has to rescue Huey from a Green Pokey. Fully removing color from any Pokey segments during a battle eliminates them. If hit by a hammer, segments are shot out. If Mario jumps on a Pokey, he takes six damage. Pokey attacks, which consist of stomping on Mario, deal significant damage. Pokeys also appear in the Mario Kart series. They first appear in Dry Dry Desert alongside Big Pokeys in Mario Kart: Double Dash! !, where they gain their modern facial look; they return in Mario Kart DS on the course Desert Hills. As well, they reappear in the retro course versions of these tracks in Mario Kart 8 and Mario Kart Wii, respectively. They also appear in Mario Kart Wii on the Dry Dry Ruins course. Prior to Mario Kart 8, Pokeys use a design inspired from Super Mario Sunshine, but in Mario Kart 8 and Mario Kart 8 Deluxe, they instead appear as they do in New Super Mario Bros. Wii. Additionally, a giant Pokey appears in the Thwomp Desert as part of October 2008's 1st competition in Mario Kart Wii. There, players had to defeat it by throwing Bob-ombs. Pokeys also appeared in N64 Mario Raceway as part of November 2008's 2nd competition. Oddly, the player faces another giant Pokey for September 2009's 2nd competition. Pokeys can be defeated by Green Shells. Pokeys appear in the Mario Party series since the third installment, and have mostly been featured in minigames throughout the series. In Mario Party 3, Pokeys make a background appearance in the party board Spiny Desert. The Pokeys in this game and Mario Party 5 use their design from Super Mario 64. In Mario Party 5, though Pokeys do not actually make an appearance in the game, there is a weapon called the Pokey Tower Gun. In Mario Party Advance, a unique Pokey appears as the guardian of a patch of desert in the Desert Area of Shroom City. Several generic Pokeys appear as enemies in Outta My Way! ; their segments can be individually punched out, and when their head is punched off, the rest of their body disappears. The Pokeys in this game, as well as Mario Party 6, closely resemble their Super Mario Bros. 2 counterparts in shape, but are yellow like the ones in later games. In Mario Party 6, Pokeys serve as the main objective in the minigame, Pokey Punch-out, where players are required to punch out the body parts to win. In Mario Party 7, Pokeys serve once again as the objective in a similar minigame, Pokey Pummel. The players must dismantle the body parts with a hammer to win. Three Pokeys also make an appearance in the background in Pyramid Park. They use their design from Mario Kart: Double Dash!! in this game. In Mario Party: Island Tour, Pokeys appear in the minigame Pokey Corral where they serve as obstacles that the players must avoid. In Mario Party: The Top 100, Pokeys reappear in Pokey Pummel, the minigame from Mario Party 7. They also appear in the background in Flash Forward from Mario Party 10, while they are not present in the original game. In Super Mario Party, Pokeys appear as enemies in the minigames Metal Detectors, and the players must take them out in Home on the 'Rang. In Mario Golf: Advance Tour, a Pokey appears in Dunes Club Practice Center. 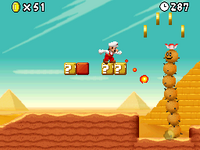 The player must shoot three shots at him to earn a Custom Ticket B.
Pokeys appear in Mario Golf: World Tour on the downloadable course Layer-Cake Desert. Here, they act as obstacles that the player must avoid hitting the ball into. In Mario Pinball Land, Pokeys use a green variation of their Mario Kart: Double Dash!! design. Here, they are found in Shifting Sands Stage. To defeat the Pokey, one must first destroy the three lower segments, then the head. In Mario & Luigi: Partners in Time, Pokeys live in the Gritzy Desert. They start out as Pokey Heads with pink flowers, but when engaged in battle, a Pokey grows additional body segments. In battle, a Pokey rams into a Mario brother to attack. The body segments can be knocked away with the Hammer. This makes the Pokey shorter (allowing the Mario Bros. to jump over it). The Pokey can also launch its body segments at the Mario Bros. To counter this attack, the Baby Bros. should hit the body segments with their Hammers. The Pokey jumps normally when hitting Mario and spins once when hitting Luigi. A Pokey can also spin its body and shoot spines at the Mario Bros. The Pokey spins the individual body part to the brother it will attack. The brothers have to jump to dodge them. In this game, only attacks to the head can damage a Pokey. The Skellokey, the skeletal variant of Pokeys, also appears in the game as common enemies in Toad Town. While Pokeys do not appear in Mario & Luigi: Bowser's Inside Story, their tooth variant Toothies do, and are common enemies in Plack Beach. However, Pokeys do appear in Mario & Luigi: Bowser's Inside Story + Bowser Jr.'s Journey, where they are enemies and recruitable allies in the Bowser Jr.'s Journey mode. They are melee troopers, and are weak to boomerang attacks from Boomerang Bros. and Wendy. However, only a maximum of two Pokeys can be befriended, as befriending a third one will have it forcefully dismissed. Pokeys appear in Mario & Luigi: Paper Jam in Doop Doop Dunes. While they don't initially appear on Mario, Luigi and Paper Mario's first visit, they begin to show up on their second visit. On their first visit, however, a Big Pokey appears as a boss alongside Paper Tower Power Pokey. Outside of battle, Pokeys will chase the trio at high speed eventually hitting or falling on a bro. Both of these can cause trip when the battle starts. Due to their spikes, Pokeys cannot be jumped on, but hammering them will make them lose their segments. When a Pokey gets a turn, it will gain two or three segments and initiate an attack. A Pokey may come up to a bro and attempt to fall on him. The player must hammer the Pokey to avoid damage. Sometimes one falls in front of a bro, launching its head; hammer countering is still necessary. Sometimes a Pokey will step up and launch its segments at the bros. The bros will need to knock the segments back to avoid damage. If the Pokey spins a segment clockwise, it will hit Mario, whereas a counter-clockwise spinning segment will hit Luigi. One that doesn't spin will go for Paper Mario. Their last attack only involves Paper Mario. A Pokey will attempt to hit Paper Mario, who must jump or flutter jump to avoid. If the Pokey's head is upside-down, Paper Mario can land on it for damage. Papercraft Pokeys are also present. Aside from Tower Power Pokey, the Pokeys' paper counterparts do not appear. Though absent entirely from Mario & Luigi: Superstar Saga, Pokeys appear in the Minion Quest mode of Mario & Luigi: Superstar Saga + Bowser's Minions, where they appear as troops and enemies. They have very high HP, but move quite slowly. They attack with a move called Whomping Whallop, allowing them to swing into their foes, similar to the Pokeys in most Paper Mario games. They, along with Goomba Towers, are among the tallest troops in the game, and like Goomba Towers, they are Melee-type. Unlike Goomba Towers, they are heavily spiked, causing slight damage to most non-Ranged troops that attack them. Due to their segments, they are weak against Boomerang Bros, and due to being plants, they are also weak against Fire Stalking Piranha Plants. They initially appear in the Teehee Valley segment. They resemble their Paper Jam counterparts, but only ever appear with four segments, including the head. Pokeys also re-appear in Super Princess Peach. In this game, Pokeys are always of three segments and a flower (including the head), and only appear in Wavy Beach. They are resistant to Perry, so they can only be defeated with Rage or Poundbrella. There are also Vibe infused Pokeys, known as Mad Pokeys, that are simply angry Pokeys that stretch vertically to block Princess Peach from passing by them. While only variants of Pokeys appeared in previous Yoshi's Island games, Pokeys themselves appear for the first time in the Yoshi series in Yoshi's New Island. In this game, Yoshi can swallow individual segments to reduce the Pokey's height, or eat its head to fully defeat it, similar to in Super Mario World. A white variant of Pokeys also appear in World 5-8: Punkey the Pokey Prince's Castle, which move along the ceiling rather than on the ground. As the stage name implies, a large, white Pokey, Punkey the Pokey Prince, is the boss of the stage. Pokeys have even appeared in various The Legend of Zelda games, such as The Legend of Zelda: Link's Awakening and The Legend of Zelda: Oracle of Seasons. If Link strikes them with his sword, sections of their body will fly off. In the Super Mario Mash-Up Pack in Minecraft, Creepers are replaced by Super Mario Bros. 2-style Pokeys. Cactuses are replaced by yellow Pokeys. Tattle This is Pokey, an evil cactus. Pokeys attack by throwing parts of their bodies or by coming up close and falling on you. Max HP: 4, Attack Power: 2, Defense Power: 0 Be careful fighting them! It'll hurt if you jump on their spiky heads! They also have an annoying habit of calling in reinforcements. Let's beat 'em quickly! Card Description This cactus column wanders in the desert wasteland. When it attacks, it hurls parts of itself at you. Literally. Which is kind of sad, really. Quotes Usual: "POKE!" ~ "Watch out—I'm Pokey!" ~ "I'm sharp as a tack!" ~ "Pokey's the name. Poking's my game." Level 13 Notice: Stats in parentheses are from the Japanese and European versions (if they differ from the original American release). Level 19 Notice: Stats in parentheses are from the game's Easy Mode. Minion Quest: The Search for Bowser bio: They may move slowly, but their HP is their pride. Watch out for the spines that cover their bodies! Weak against boomerang wielders. 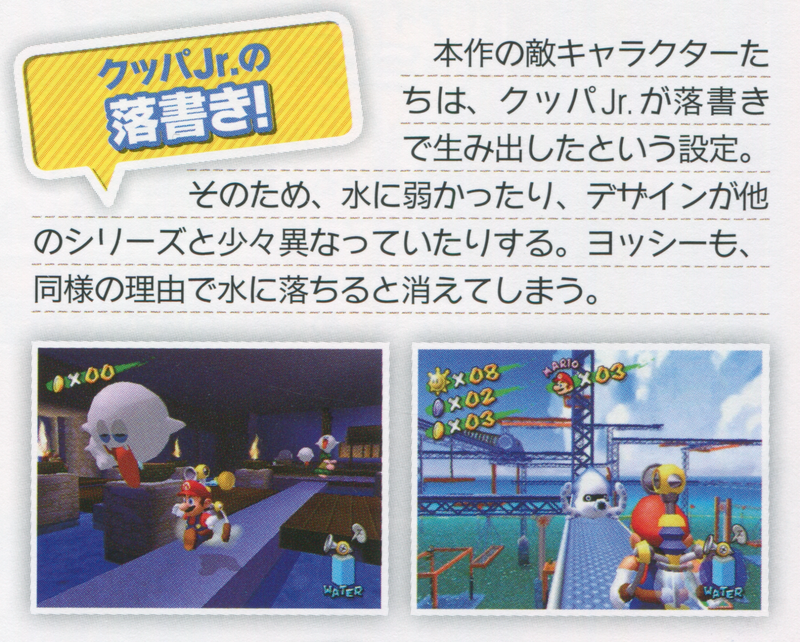 Bowser Jr.'s Journey bio: They may move slowly, but their HP is a point of pride. They have protective spikes on their bodies but are weak against boomerang attacks. Watch out for these cactuslike enemies in the Good Egg and Dusty Dune Galaxies. These creatures typically have three to five body segments that Mario must destroy individually. The green Pokeys are easier to defeat--just jump on their heads. The red ones are more challenging -- Mario must star-spin into each body segment. Could easily be mistaken for a a cactus, except for the eyes and the mouth, and the way they roll...er, stroll... around the desert with such careful balance. Check out the pretty flowers these guys are sporting in Super Mario Sunshine! Pokeys are a bit like cacti, except with eyes and mouths, and they're made up of prickly balls piled on top of each other. It doesn't exactly make for the most stable body, so they have to wiggle their way around really carefully. Also, the ones in Super Mario Sunshine have pretty flowers on their heads. Definitely worth a look! Notebook bio: "This spiky cactus will wobble its way toward you. Painful to touch, it can be defeated by a kicked shell." For this subject's image gallery, see Gallery:Pokey. Daruma Sanbo From saboten, cactus. ↑ UK Nintendo Magazine #54 (March 1997), page 23. ↑ An excerpt of page 107 of the Encyclopedia Super Mario Bros.Media:ESMB Bowser Jr Graffiti.png. The title of the box is 「クッパＪｒ．の落書き!」 which means The graffiti of Bowser Jr.! and the text says 「本作の敵キャラクターたちは、クッパJr.が落書きで生み出したという設定。そのため、水に弱かったり、デザインが他のシリーズと少々異なっていたりする。ヨッシーも、同様の理由で水に落ちると消えてしまう。」 which means This game's enemy characters are created by Bowser Jr.'s scribbling. That is why they are weak to water, and differ slightly in design from the rest of the series. Yoshi also vanishes if he falls in water for the same reason..
↑ Super Mario Galaxy Prima Official Game Guide, pages 197 and 204. ↑ From the ending scenes of Super Mario Advance as localized by iQue. 无敌阿尔宙斯 (August 28, 2013). 神游 超级马力欧2敌人官译 (Official names for iQue Super Mario 2 enemies). Baidu Tieba. Retrieved February 2, 2017. ↑ 无敌阿尔宙斯 (August 28, 2013). 神游 超级马力欧世界 敌人官译 (Official names for iQue Super Mario World enemies). Baidu Tieba. Retrieved February 2, 2017. This page was last edited on April 14, 2019, at 11:03.